Looking at Charlie’s cellphone one cannot help but realize how technology and good old fashioned ground pounding can aid in taking that deer next season. Deer hunting in the 21st century has come a long way. Hunting season is upon us. Modern technology allows hunters to observe their quarry all year with the use of trail cameras. Some can even connect to cellphones and computers so the hunter can monitor the activity on a specified piece of land. The hunter who consistently takes big bucks year after year spends hours in the field, reads all he can find about the animals and makes effective use of trail cameras to pattern their activity. He does not overlook any opportunity to learn. In the case of white-tailed deer, big bucks have different feeding patterns and travel different trails in summer and early fall than later in the year. In response to hunting pressure deer change their travel patterns at the opening of deer season. Tracks lead to either feeding or bedding areas. 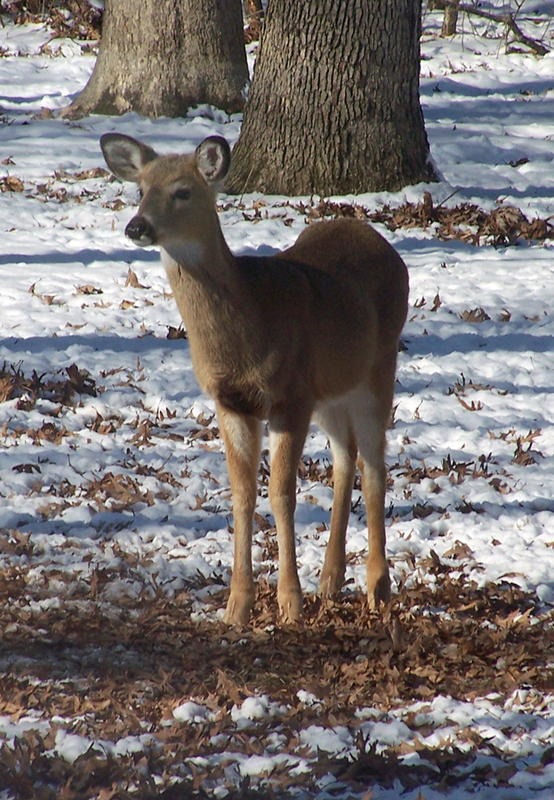 Deer will move toward bedding areas in the morning and toward feeding areas in the evening. This tells you where to focus your hunting during those periods of the day. Bucks make rubs along the trail on the side of the tree he is facing. This is another clue to which direction he is moving on a trail. Seldom does he use the same trail both coming and going to the feeding/bedding areas. Later the rut activity makes for more changes as they drive off rival bucks and seek out the does still in estrus. Bucks maintain these habits until late winter when feeding habits force them to change in concert with the change of diet from brose to grasses. Sign found by the scouting hunter in spring is sign of most importance to the hunter in pursuit of a dominant buck. Post season hunters can get a clear picture of where he will be in the fall by scouting a deer’s home area. By making field notes one can map the planned hunting area. Expertise in map making is not a requirement. You just have to be able to find the same terrain in the fall. Mark wooded areas, swamps, sloughs, ridges, scrapes, rubs, bedding areas, feeding areas, water, doe trails, buck trails and where you sight game. The use of a GPS unit helps by using way points in the same manner. For those wanting a more accurate map, local governmental agencies often have maps for sale at a nominal price. They portray roads in the area. Add some of the things mentioned earlier and some additional items might include changes in terrain such as small valleys with bluffs on each side that funnel deer activity. Creek crossings often are full of sign as animals depend on the water sources. Small ponds, stock tanks, and creeks become regular watering holes for all wildlife. A benefit of post season scouting is that signs found are from animals that have made it through the season and the winter. They should be still around the next fall. Due to the lack of vegetation late in the season the amount of sign is not as clear as is the case in late summer. Rubs are a bit hard to find, as they are aged and difficult to distinguish from ones of previous years. Scrapes are easy to spot. Mark them for future reference to see if they are refreshed. Fresh rubs in an area with older ones leave the impression that the deer making them has been around for a while. Deer return to old scrapes from one year to another. Once they begin to use them they will return to refresh them every 12 to 48 hours. Scrapes usually are located along field edges where there is a change from one type of vegetation to another. They are almost always beneath an overhanging branch that is about 4 to 5 feet off the ground. In making the scrape the buck leaves his scent on the tree by depositing his saliva as he licks or chews the branch. If no suitable tree is available deer make scrapes next to saplings and leave a rub on the tree itself. Rubs serve two purposes. They aid in getting the velvet off of antlers during the early season. Later they mark the buck’s territory. The territory is the buck’s breeding ground. The best prospect is an area with both old and new scrapes and rubs in large numbers. The chance of a big deer being there is good. Deer tracks tell one of the presence of game. A single track of an animal wandering aimlessly through the woods is not one that needs recording. It is the track of a feeding animal and one probably not likely to use the trail again. Tracks of lots of deer indicate a major trail going to or from feeding and bedding areas. Such trails should be recorded and check frequently for activity. Check the tracks for size. If tracks are large mixed with small ones then you are looking at a trail used by does and fawns. Check the area to the side of such trails for large tracks running in the same direction but not on the trail. Bucks usually leave these tracks. Bucks like to stay near the does but seek heavier cover. By setting up stands to use the appropriate trails at the time of day indicated by the sign, a hunter increases his chances. Posted 01/16/2016 by Donald Gasaway in Misc. The Mississippi River extends the entire length of Illinois varying fishing opportunities in the various pools formed by navigational dams. For bass fishing probably the best pool is Pool 13 which extends from Lock & Dam 13 near Fulton, Illinois upstream to Lock & Dam 12 near Bellevue, Iowa. On the Illinois side that includes the Illinois communities of Savanna and Thomson. The pool begins just upriver from Clinton, Iowa. Pool 13 is 34.2 miles in length with a surface area of about 30,000-acres. Much of the shoreline is contains scenic overlooks. There is stretches of rip rap along the major channels and in the tailwaters. 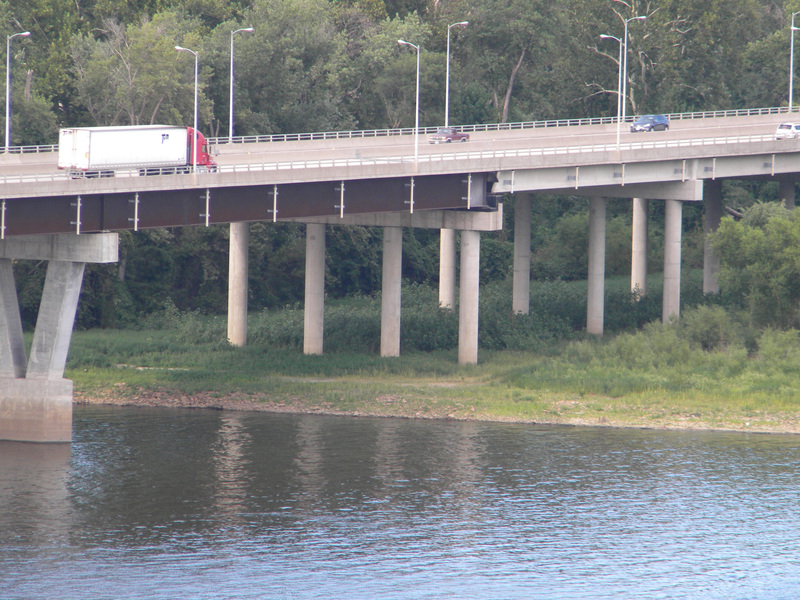 Numerous state and municipal boat ramps off of Illinois Route 84 which parallels the river provide easy access to the river. Many more are across the river on the Iowa side. The locks & dams create a somewhat stable water level. The pool is a combination of river and lake habitat which leads to a development of good marsh and aquatic habitat. It begins with the turbulent water of the tailwaters below Lock & Dam 12. As the waters approach the next Lock and Dam them becomes a large open lake. In between are deep main channels for navigation. Off from it are a number of side channels, slow moving sloughs, backwater bays and lakes. What establishes it as such a good fishery are the size as well as the diverse structures and habitats. Bass become aware of the volume of water passing thought the pool. As it increases, the fish move into slower side channels and backwaters. There are extensive areas of emergent vegetation. Pondweed and coontail dominate the submergent vegetation. Lotus and water lily make up the floating vegetation. The smallmouth bass and largemouth bass display different habitat preferences this time of year. Smallmouths tend to stay in a one-mile radius. As the spawning season approaches they will move into the tributary streams or other rip rap areas. Largemouth, on the other hand move more readily. In spring they are in the areas adjacent to open water and those with a warmer water discharge. As the backwater bays warm from the sun’s rays, largemouth bass move to them. There are numerous bait shops in the quad-cities area which will provide updated information on the fishing action. Mild winter temperatures allow fly-fishermen to enjoy fishing in the dam tailwater. This productive fishery appears when the water level above a dam rises during winter months. Clear, deep lakes often receive a stocking of rainbow trout. The fish immediately scatter until summer temperatures force them to suspend in the deep water. In the winter, water levels rise above the level of spillways and flow into tailwater. Rainbow trout wash over a dam into a spillway basin and the creek below. They remain there until the late spring when water temperatures rise to a point that the fish die or become a meal for predators. 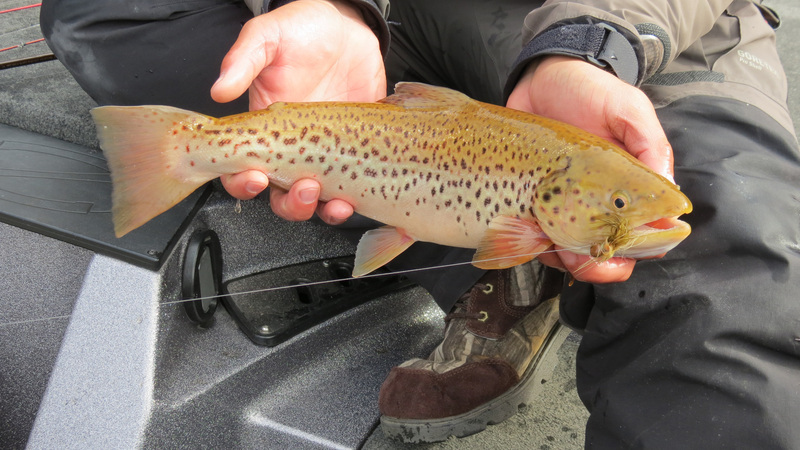 During the months of February and March, early season anglers fish for these trout as they concentrate in the deeper pools. The secret is to fish early in the morning just at the break of day. The weather is cold in February. To the diehard trout angler it is worth the discomfort. It helps to wear clothing that blends with the natural cover. Bright colors tend to spook trout. Warm dry clothing is important for both comfort and safety. Getting wet in cold weather can be life threatening. Sneaking through the brush covers the angler’s approach. Trout remain elusive and wary even in cold weather. It is important to avoid quick movements. Approach as silently as possible. The clatter of rocks and gravel crunching beneath the angler’s feet alerts trout to danger. Trout tend to face into the current. Therefore, the angler should approach them from downstream if possible. It is important to walk along the bank not through the water. Perhaps a recommended rod and line combination might be a 6-½‑ or seven‑foot rod with a 3‑ or 4‑weight line. The smaller rod works better in any brushy areas. The short, light rod is fun when stressed by a trout. Some recommended flies might be anything from #16 to #20 with dark bodies and stubby wings and no tails. Any midge, nymph or caddis imitation seems a good bet. Trout, in winter, tend to pool up in the deeper water. They seek eddies, edges of runs, the creek bank, and any place of slow water. Trout feed slowly in quiet water as if to conserve energy. They do not make the spectacular rises that are common with summer fish. This cold-water trout fishing can be uncomfortable and even dangerous. It has its rewards. Nevertheless, it is vital to remain dry and warm. Frostbite and hypothermia are ever-present dangers. This fishery will never exceed the summer trout fishing in popularity or productivity. Still, it is a fun way to spend a winter morning when the “correct” time to fish trout is many long days away. 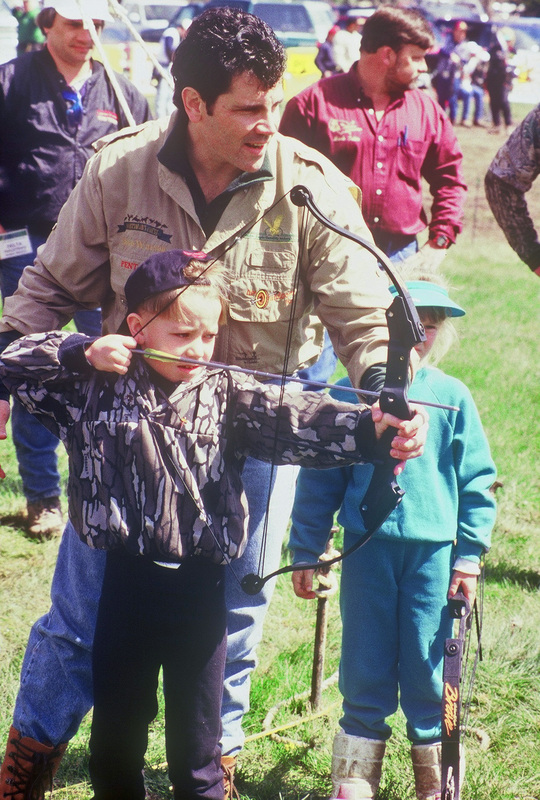 If you can instill in the younger set the good feelings and emotions you feel toward archery it will provide a family-friendly atmosphere where safety, trust and fun come first. The parent can only determine if the child is old enough for archery. They know how well the child follows directions and responsibility. They must be mature enough to be considerate of safety for both themselves and those around them. Children need to understand that they should not point an arrow at anything they do not intend to shoot. Go over safe practices on the range and is shooting/handling a bow and arrow. Being patient is important in any activity with kids. They do not stay focused as long as an adult. The activity must be fun. Sometimes we as adults tend to push too hard. Do not take the fun out of archery by pushing too hard. Kids need to move at their own pace. When it seems the child is getting bored with shooting or the session is getting too long, it is. Probably a good starting point is to determine eye dominance. Everyone has one eye that takes over when sighting a gun or bow. The brain selects that eye unconsciously. Most people think that if they are right-handed then their right eye will dominate. Not necessarily so. Six in ten people are left-eye dominant. Once you make this determination move on to the choice of a bow. Left eye dominant people need a left hand bow even if they are normally right handed. Determine the draw length required. Also it is necessary to determine the poundage that the child can best handle. If you over rate their capability, they will be frustrated and give up. Most adults these days will choose a compound bow over a traditional long bow. Not so with the younger set. They have been watching movies recently where the hero/heroine shoots a more traditional bow and they want to emulate their heroes on the screen or television. The compound bows require peak poundage when pulling is determined. Many are adjustable for a variety of poundage. It is advisable to have the child pull as much as he can and then make that the bottom poundage. If the bow is not adjustable let it be the peak weight. With a recurve bow there is so much room for growth. They do not have to come to full draw right away and still shoot satisfactorily. As young muscles strengthen they are able to grow in strength. They are able to pull the bow back further and increase the poundage that they pull. Regardless of the bow being used kids need to experience success. This can mean moving the target closer for them. Once that is no longer challenging the target move the target back. Begin with ranges as short as 6 to 8 yards so they can have fun sticking an arrow into it. For children having fun is everything. They are too young to be really competitive. They participate for the enjoyment of the moment.